As an overprotective mom of two rambunctious furbabies, I try to make sure our dogs are worshipped properly. They eat good food. They have (more than) plenty of toys to stimulate their brains and help burn off energy. They’re socialized. They’re adored. 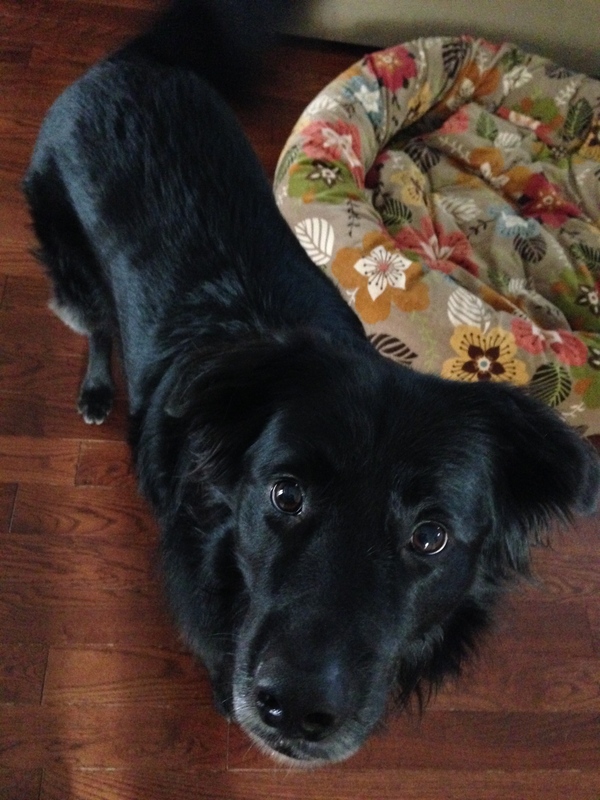 But there are certain components to pet-ownership that we, as a family, haven’t addressed: how to handle medical-related emergencies and who would take care of the pups if one or both of us are incapacitated. I’m not addressing the latter here today. Don’t worry. No tears. When I realized my Type-A Virgo mind had neglected to prepare for the worst, I vowed to resolve it. I’m a planner. I plan. This is yet another New Year’s Resolution. 2014 is shaping up to be a very busy year. 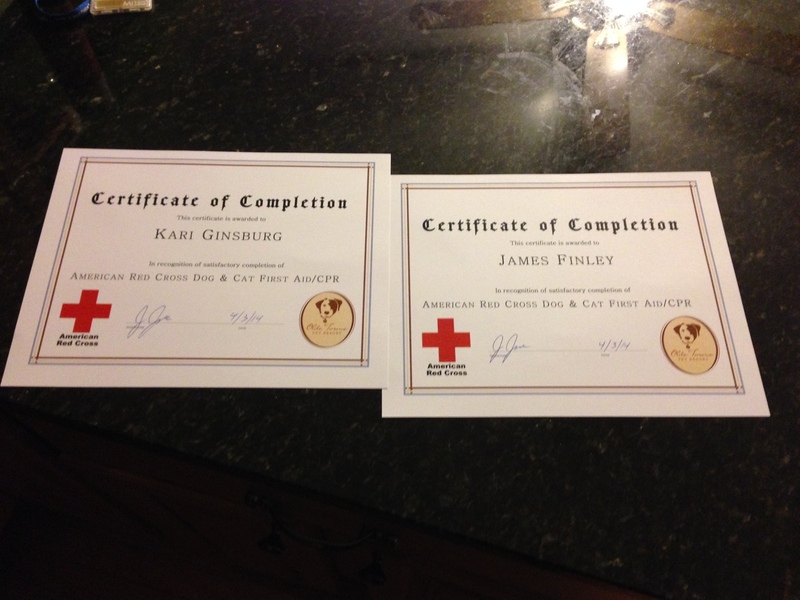 And so, last night James and I attended a humans-only American Red Cross Dog & Cat First Aid/CPR Certification class. 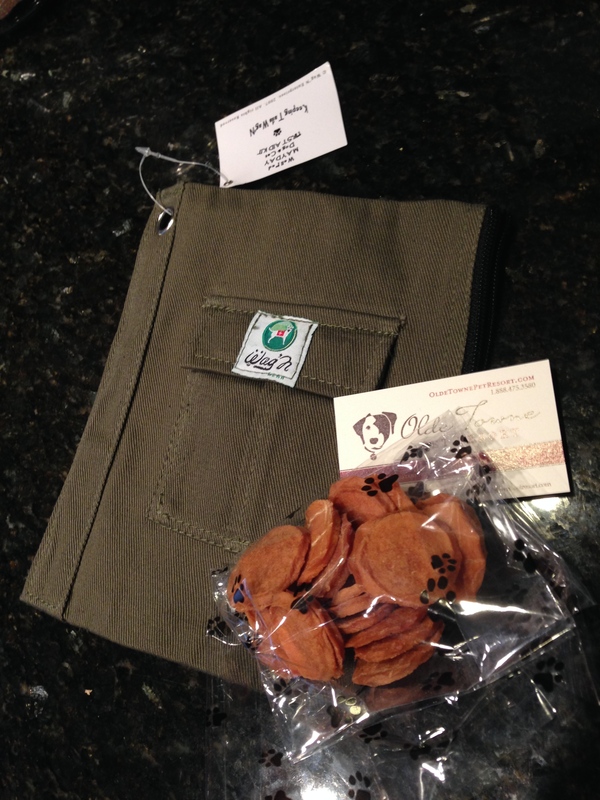 It just so happens that Olde Town Pet Resort (are you tired of us mentioning them yet?) was hosting the class, which made the decision to attend very easy. It’s convenient, we like how they take care of our dogs, and the staff is welcoming and friendly; basically, a no-brainer. 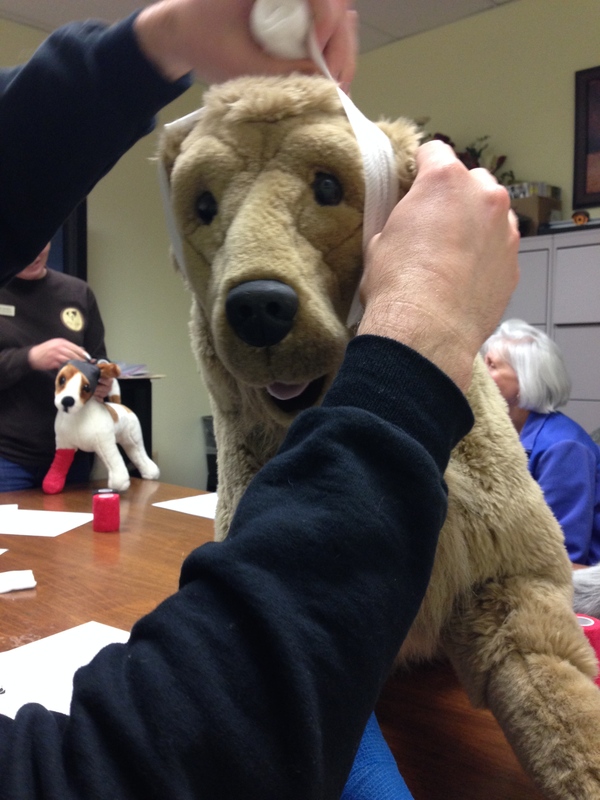 in the middle of practicing ear bandaging. 2. Don’t panic. The instructor said this 13 times during our training. I kept tally marks on my notes. In the event of an emergency, don’t panic. Keep your voice calm and your own pulse steady. Like emergency response with children, if you’re calm you’ll temper their freak-out. However, I suspect that if a snake is hanging from my dog’s nose or a bone is sticking out of her skin, I might not be able to temper my own freak-out. Maybe that’s a good opportunity to put my theatre school education to use. 3. 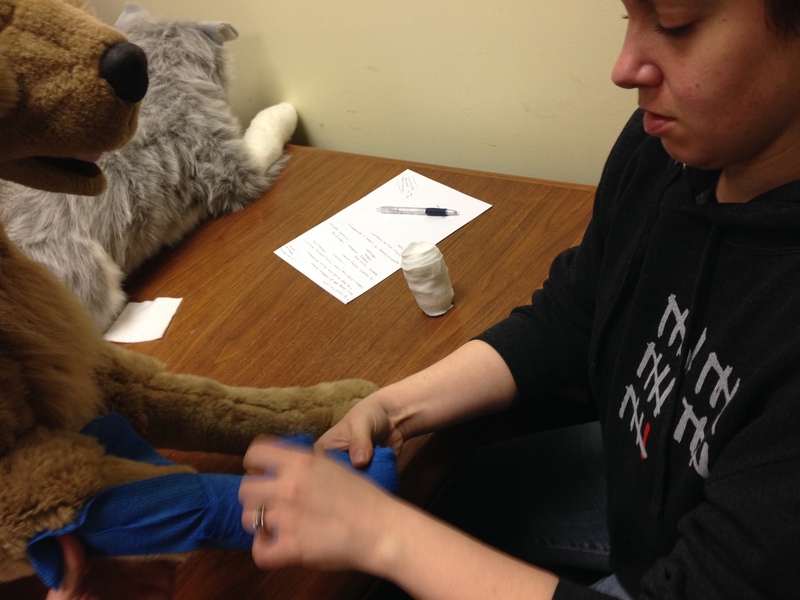 Before administering treatment to an injured animal, create a soft, temporary muzzle. 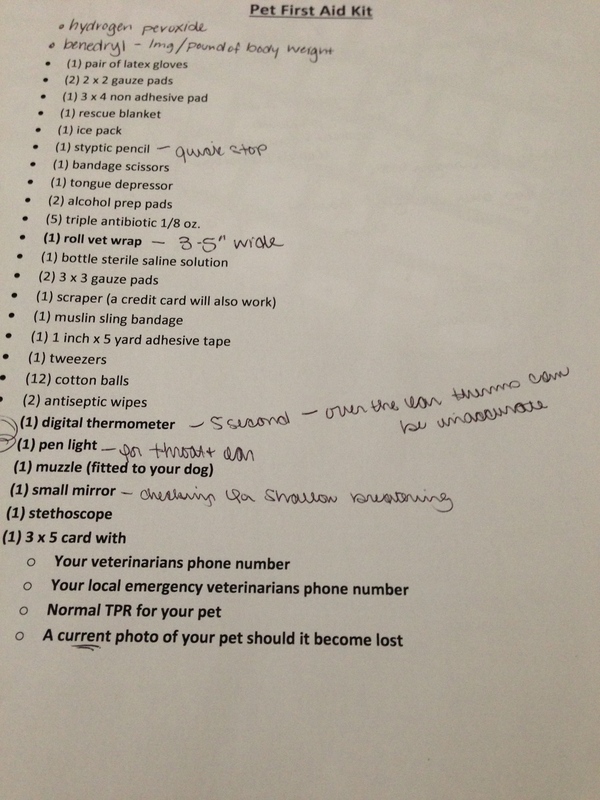 If your pet’s not a biter, you still need to do this. You never know how an animal will react when he or she is in distress. 4. If you suspect your dog has been poisoned and you call the National Animal Poison Control Center, they will ask for your credit card information prior to giving you treatment information. There is a fee. Pay the fee. 4a.– if advised to use Hydrogen Peroxide to counter-act suspected poisoning, try to administer this on a tile or wipeable floor. Whatever you get down is coming right back up. 4b. in case you’re wondering, pretty much everything humans use every day is a poison and/or choke hazard to pets. 5. While we’re on the topic of choking: the easiest first-step way to clear a small dog’s throat of foreign objects is to pick them up by their hind legs with their backs against your legs, and let them hang upside down. For larger dogs, try a wheel-barrow method of raising only their hind legs. 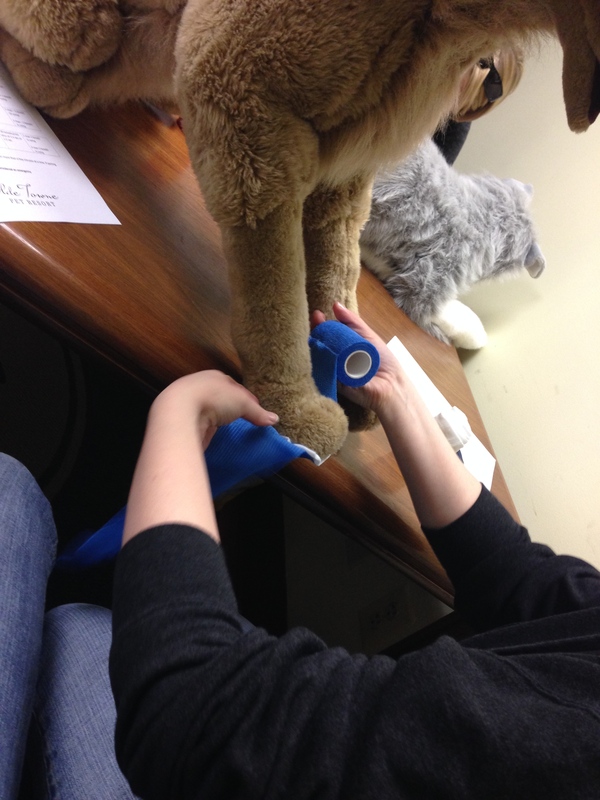 You can also try a finger sweep, but watch out because your dog may respond to the dislodging by biting down. And of course, there’s the Heimlich. 7. We’re going to need to keep a lot of gauze pads and vet wrap in the house. MJ is forever scratching her paws and her nailbeds attempting to climb trees and catch wildlife, so paw compression wrapping is something we’ll master quickly. Step one: clean the wound and apply ointment, if you can. Step two: apply gauze pads to the area. 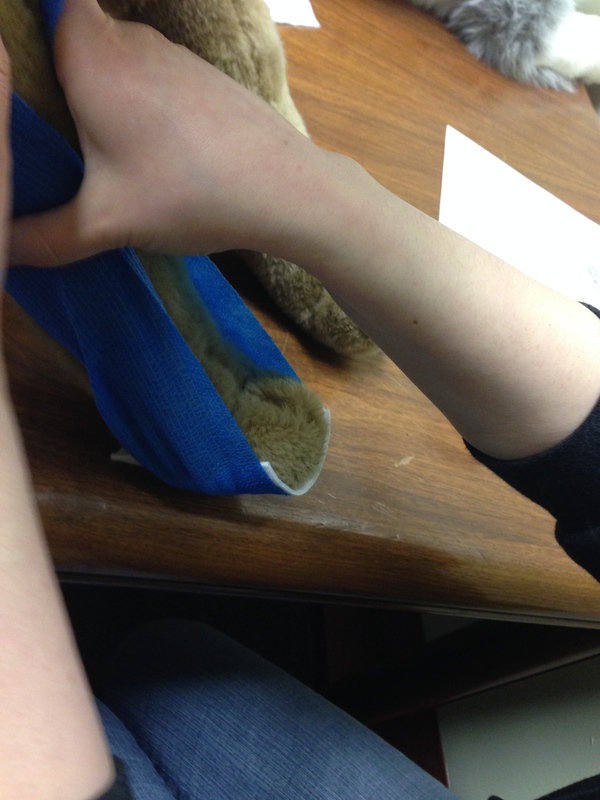 Step three: cut the vet wrap to make a stirrup around the gauze pads, applying pressure to the wound. Step four: using more vet wrap, start wrapping around the stirrup in the middle of the leg, covering the entire leg and making sure no fuzzy bits of gauze are sticking out. 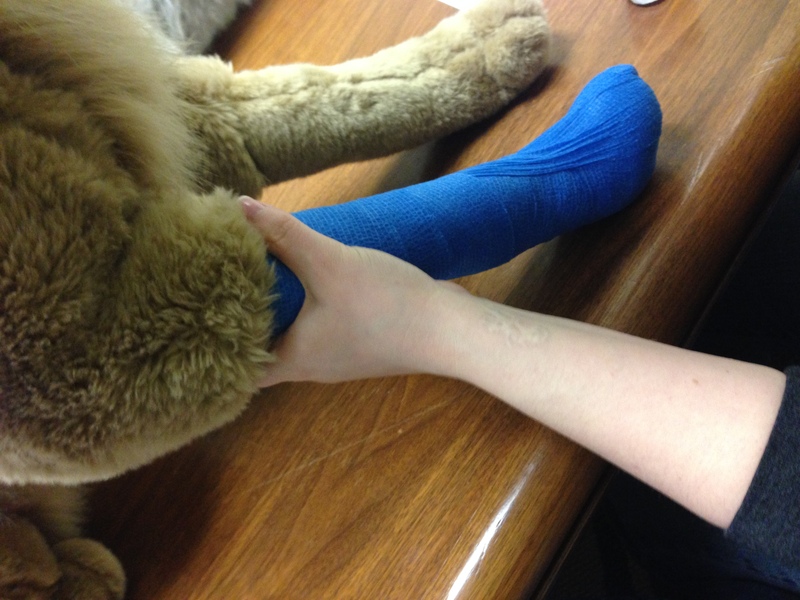 Step five: make sure to end the wrapping at the back of the animal’s leg, so he or she can’t unravel your effort. You’ll know you’ve wrapped too tightly if you can’t get one finger under the top of the wrapping. 6. Always call your vet or the emergency veterinary hospital. ALWAYS. This entry was posted in 2014 and tagged American Red Cross Dog & Cat First Aid, ASPCA Animal Poison Control, creating dog muzzle from gauze, Heimlich for dogs, MJ, Olde Towne Pet Resort, Pet CPR, Pet First Aid, Pet First Aid Kit, rescue dogs, this post made james laugh out loud, Zozo by klgf. Bookmark the permalink. they shuld be proud they pazzed de class…show off yur certifcatz !!! we wood…. we hope ya never haz ta USE any oh thiz stuff ….coz then yur mom wont bee freekin… N yur dad wont bee sayin…. glad we getted two oh theeze things…. N ewe pupz will bee sayin…hay….lets go two de ice creem stor… ..sinz we iz all in de car ~~~ ! !